Above: Harris Niazi, M.D., treats a patient at Family Health Centers of San Diego’s urgent care clinic in Logan Heights, Dec. 18, 2018. South of downtown San Diego’s towering skyscrapers, where hundreds of homeless people have taken refuge in large tent shelters or are languishing on the streets, Dr. Harris Niazi serves on the front lines of caring for some of the region’s poorest residents. The modern, three-story clinic in the Logan Heights neighborhood provides numerous health and support services with a commitment to serving uninsured and low-income residents. It established its own residency program to help recruit and retain medical professionals like Niazi and address gaps in care. Most patients are among the millions of Californians who joined Medi-Cal under Obamacare, including Lorenzo Sarabia. The 74-year-old suffered a heart attack three years ago after losing his job and becoming homeless. He said the clinic is his lifeline. “For me it’s very important because if we didn’t have that I’d probably die on the streets,” said Seravia, who spends nights on downtown sidewalks and relies on free handouts for food. Others who seek help at the clinic have no insurance at all, Niazi said. Layered beneath acute issues that draw people to the clinic, such as the flu, colds and infections, are often a multitude of complex problems. Niazi said his job requires a special set of skills. He said that includes how to talk to people without being judgmental and learning how to listen, but most importantly, to understand where they’re coming from. “To be able to treat them, you have to know what it feels like to be in their shoes,” Niazi said. The assistant medical director knows exactly what it feels like. He grew up in poverty and watched his parents struggle with health care — in and out of emergency rooms, mismanaged chronic illnesses and language barriers. It’s why everyone at his clinic is treated as someone, he said. 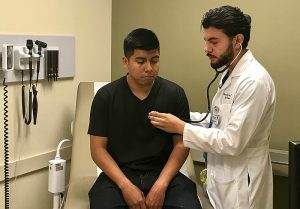 Finding dedicated doctors like Niazi to work at Family Health Centers’ 23 primary care clinics in San Diego County that serve nearly 3,000 people each day is a challenge amid a growing physician shortage, said Anthony White, director of the center’s community and government relations. That’s why the center started its own doctor residency program that trains and works to retain physicians to help fill the gap. The three-year program gives medical graduates real world experience with an emphasis on improving health disparities. Residents rotate through three clinics providing primary care medicine, including at a location in San Diego’s City Heights community that serves a large number of refugees. 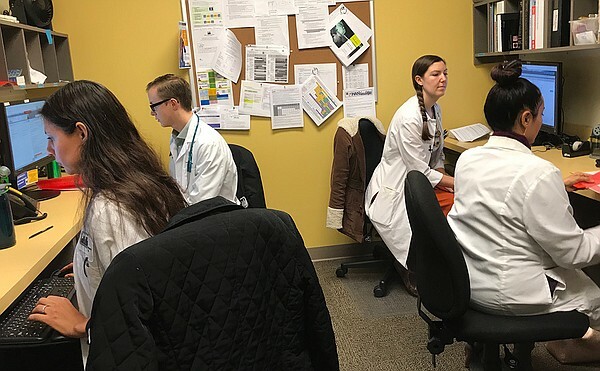 Medical residents log patient information during a training session at a Family Health Centers of San Diego clinic in City Heights, Jan. 4, 2019. Training also includes inpatient medicine, surgical and elective experiences at Scripps Mercy Hospital, Rady Children’s Hospital and University of California San Diego Medical Center. The rigorous interview process is not just about who has the best grades, White said. That’s why Sarah Matthews applied. The third year chief resident knows a medical specialty would boost her salary, but it’s not about the money, she said. It’s about helping those in need. Financial tuition incentives are also available for medical students who commit to working in underserved communities. Gov. Gavin Newsom plans to expand the Obama-era funding using part of the $1 billion in Proposition 56 tobacco tax money that he’s pumping into health care. Bazzo said the timing couldn’t be better as 25 percent of California doctors are nearing retirement. Meanwhile, the number of people 65 and older in San Diego County is expected to double over the next decade, adding more strain on the health care system. Bazzo said a physician shortage would hit underserved areas hardest. Niazi is a recent graduate of Family Health Centers’ residency program. It’s a place he plans to stay, he said, because it’s where he’s needed most. You can support a Resident in Training here. Learn more about Family Health Center of San Diego’s Family Medicine Residency Training Program. For the original article, visit KPBS.org.